the days are getting longer, next week is the return of daylight savings, and both of these factors add up to brightness at bedtime for baby. 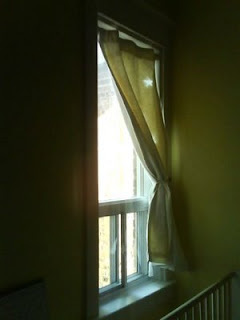 and the curtain on his window is the one that was there when we moved in - a filthy piece of floral peach nylon. yuck. so today i made a new curtain one that is opaque enough (interlined with quilt batt!) 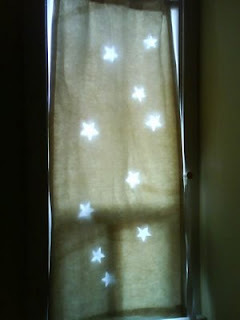 to keep out more light, but a little more fanciful as well - to give him his own bit of night sky to dream about. i also installed a proper curtain rod - the previous tenants had one made out of cardboard (!!! ? !) but now he's got solid wood.